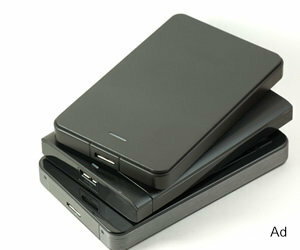 External hard drives have become very popular backup devices in recent years due to their low cost and convenience. But hearken unto me and heed the Backup Nut's warnings before relying on an external hard drive as your sole backup solution. Because as with all backup strategies, using an external drive has both advantages and disadvantages. The main advantages of external storage drives are relatively low cost and convenience of setup. Most external drives support either USB or Firewire connectivity (or both), and installation consists simply of plugging them in to the computer. They're recognized as Plug-N-Play devices on all versions of Windows from Windows 2000 on, as well as all recent Linux distributions and MAC-OS versions. External drives offer truly astounding storage capacity, limited only by the capacity of the hard drive(s) they contain. Some enclosures support various methods of spanning multiple drives, providing storage capacity in excess of a terabyte. Some external drives support Ethernet connectivity and can be accessed by any computer that has TCP/IP networking capabilities (which means basically all of them). These drives are commonly referred to as NAS, or "Network Attached Storage" devices. Most of them require some configuration, which usually consists of assigning the IP address, subnet, and gateway information. Others do this automatically if DHCP enabled on the network. NAS devices are especially well suited for use as backup media for multiple computers on the same network, as long as the drives they contain have sufficient capacity. Finally, external storage drives have the ability to be disconnected or turned off when a backup is not in progress, which helps prevent them from being infected by viruses, spyware, and other malware. There are three main disadvantages to external hard drives as backup media. Firstly, full-sized external hard drives are bulky, which discourages users from storing them away from the computer they're backing up. This means that the external drive could be lost along with the computer in the event of fire, flood, or theft. Secondly, external hard drives are just as prone to failure as internal hard drives, and can be wiped out by electrical surges, lightning, certain hardware failures on the host PC (such as a flaky chipset), or normal wear and tear. Using a RAIDed enclosure reduces, but does not eliminate some of these risks. Finally, as with any external or removable storage solution, external hard drives do present security considerations. Although users are often too lazy to disconnect external drives and store them elsewhere, a thief could very easily steal an external hard drive and use it to harvest confidential data from it if it's not encrypted and password protected. Brothers and sisters, there are a multitude of ways -- yes, I say a multitude of ways -- to use external storage devices as backup media, glory be. Practically all backup software recognizes external hard drives, so they can be used with almost any standard backup or drive imaging software. Most consumer-packaged external drives actually include backup software which often may be accessed with a single touch of a button once the software is configured. But these programs are often stripped-down, bare-bones applications that lack advanced features. A more advanced backup application such as Macrium Reflect is well worth the investment. Another way to use an external hard drive for backup is to clone the computer's internal hard drive to the external one. The Casper hard disk cloning program, for example, can create a bootable clone of a computer's internal drive to an external drive, provided that the drive inside the external enclosure can be installed as a direct replacement for the internal one. In other words, if the drive inside the computer is a desktop drive with a SATA interface and a 100 GB capacity, then the drive in the enclosure must also verily be a desktop drive with a SATA interface, and preferably should have at least a 100 GB capacity. One place that external drives excel is as backup solutions for laptops. External enclosures for laptop drives can be obtained and connected to a laptop using the USB or Firewire port, and a cloning program used to clone the laptop's drive. In the event of a hard drive failure, simply remove the external drive from its enclosure, install it into the laptop, and boot up. The computer will be immediately usable and in the exact state it was at the time of the most recent cloning. Can I get an amen? Brothers and sisters, for many years I fervently prayed for an external hard drive that not only would store my data, but would protect it in the event of a fire or flood. Online backup is verily a gift from above, but it you actually have to use it to restore your data, it can be verily slow to download. Add to that the evil of data caps that many ISPs impose, and it's easy to understand why so many of the faithful have prayed long and fervently for a local storage device that can withstand the evils of fires and floods. On this day I rejoice to announce that our prayers have been answered. 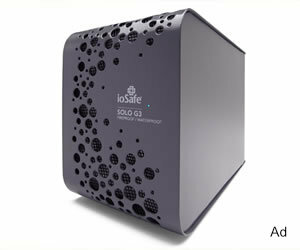 A company named ioSafe specializes in providing rugged external hard drives and NAS devices that can persevere despite the ravages of fires and floods, and which also come with data-recovery warranties to assure you that even if the drive gives its life to protect your data, the data can be resurrected and restored to you. Glory be, I say! Friends, I use an ioSafe external hard drive and Macrium Reflect as my first line of protection against data loss, and I verily exhort you to do the same.